Captain Christopher “Chris” Coletta has more than 35 years of fishing experience, beginning with his fondest memory of fishing with his father “Fiore” in Oyster Bay when Chris was 12 years old. By the time Chris turned 16, the excitement, passion and pursuit of the best local fishing spots while listening to his favorite song, Otis Redding’s “(Sittin’ On) The Dock of the Bay” propelled Chris into a business where he clammed and caught lobsters to sell to local restaurants. He made a pretty good buck for his age. While attending college in Hawaii, the young entrepreneur refined his big-game fishing skills by working with some of the world’s most respected charter captains. Chris learned the ropes in one of the Pacific’s most demanding and high-profile big game environments. 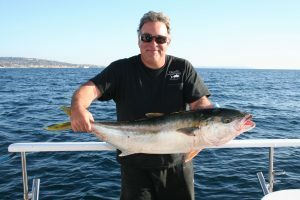 Even when life took Chris to landlocked states such as Ohio and Arizona, he took clients on numerous fishing excursions into Mexico for it was in his blood and he could not be away from saltwater for very long. Whether Captain Chris’ is running the boat or one of his carefully chosen Captains are at the helm their professionalism will shine through when you spend a day on the Ocean with this delightful and knowledgeable group. Welcome aboard and let’s go fishing! Don’t forget to read Captain Chris’ Journal.